Valvil Ramar Kovil at Thiru Pullaboothangudi is one of the 108 Divya desams and one of the Vaishnava Navagraha Parihara kshetrams around Kumbakonam. 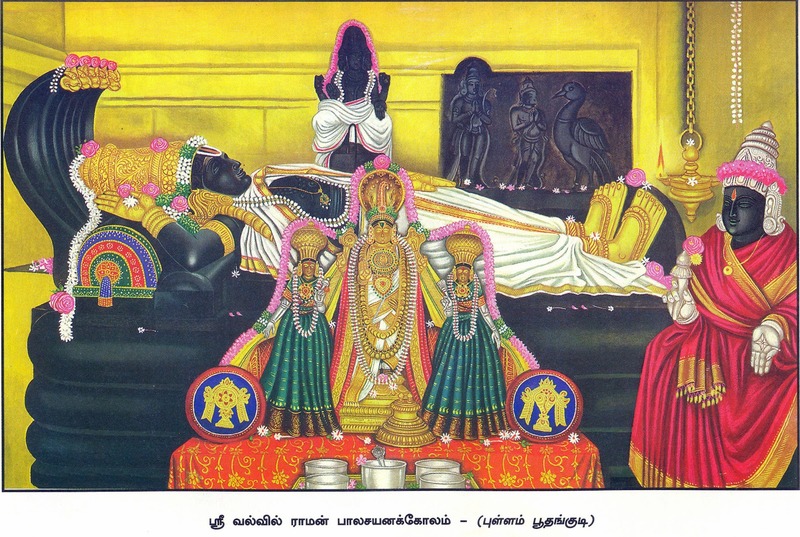 The Moolavar is Valvilraman and the Utsavar is Raman at this temple. 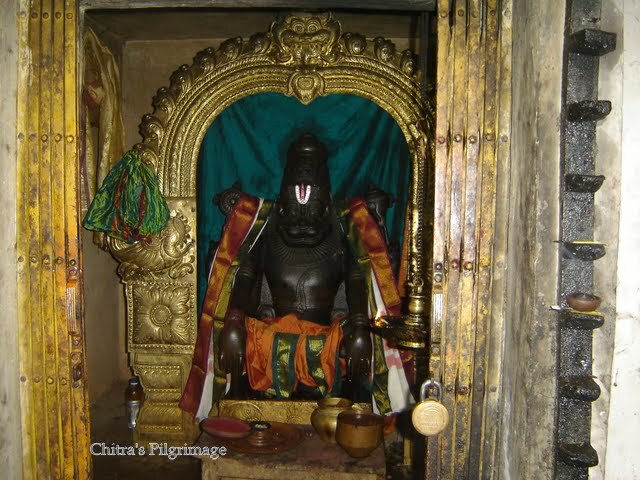 The thayar or the Lord’s consort at this temple is Hemambujavalli. The holy water is Jatayu theertham. The vimanam is Shobana Vimanam. He is facing East and present in Kidantha kolam or a lying posture. 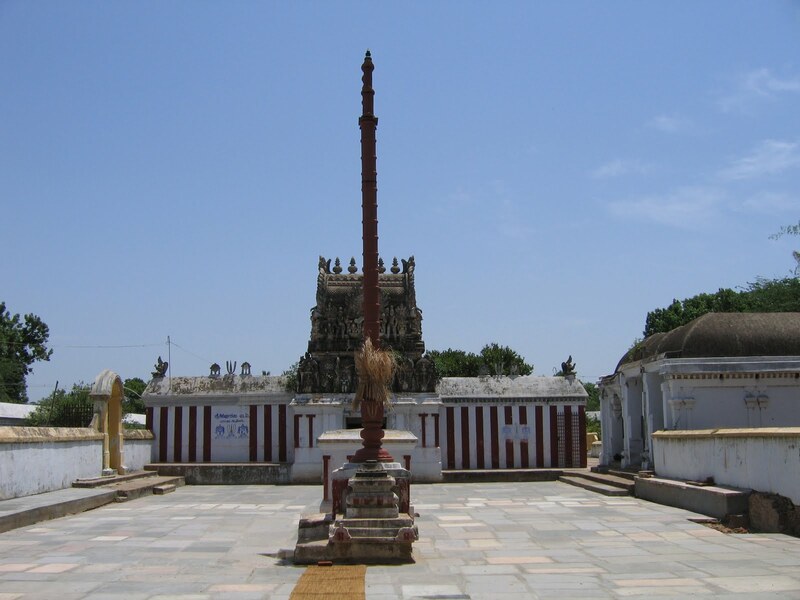 Located just under 10kms West of Kumbakonam and 3kms off Swami Malai on the Thiruvaikavur road between Cauvery and Coloroon rivers is the Valvil Rama temple in Pullam Bhoothangudi, a Divya Desam whose legendary tale dates back to Ramayana and described above by Thiru Mangai Azhvaar in his Periya Thirumozhi verse. This is the only Divya Desam where Rama is seen with conch and chakra in a Bala Sayanam Posture. The story of Jatayu Moksham is associated with this temple. When Rama was serving his time in the forest, Sita was abducted by Ravana. Jatayu, the King of Birds, saw this and immediately came to the rescue of Sita Devi. He fought a valiant but vain battle and sacrificed his life in the process. Rama and Lakshmana who came in search of Sita Devi saw Jatayu. Jatayu narrated the abduction of Sita Devi. A dying Jatayu requested Rama to perform his last rites. Normally, while performing such ceremonies the wife must be present with the husband. Since Sita Devi had been abducted, Boo Devi, another form of Sita Devi took her place and Rama performed the last rites of Jatayu. The same story is associated with another Divay Desam also, Thiru Putkuzhi which is 7 Kms from Kanchipuram on the Chennai Vellore route. As Jatayu belonged to Pul(tamil) family of birds and Rama rested (meaning kudi in Tamil) here after performing the last rites of Jatayu this place is known as Thiru Pullaboothankudi. Rama who could not perform the last rites of His father Dasaratha took solace from performing the last rites of Jatayu. 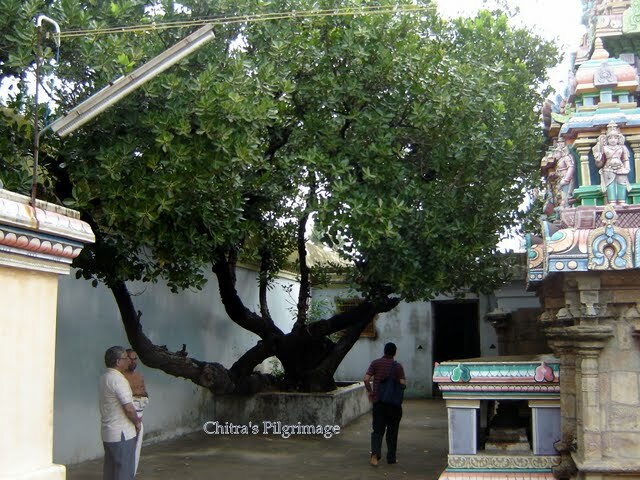 The punnai tree inside the temple premises is believed to be the tree under which Rama rested. Usually Rama is seen in a standing posture (Ninra Kolam) at all the temples. In this temple he is seen in a lying posture (Kidantha Kolam). Is this because he is believed to have rested here? Another interesting feature is that Rama is seen hold Sangu (Conch) and Chakram (discus), whereas He is usually seen holding bow and arrow. This is the only temple where Raama is in a reclining posture with all his ornaments and 4 hands. Sita is not seen with the Moolavar deity as this temple relates to the time when Raama is separated from her. This is the Budhan Parihara sthalam. This temple is considered to be a Pitru Kadan Nivarthi sthalam. Devotees believe that praying here will also remove marriage obstacle. Those looking for improvement in career or seeking employment can pray to Udyoga Narasimhar and Yoga Narasimhar at this temple for manifestation of their desires. The temple is close to Swamimalai near Kumbakonam and can be visited along with other temples having Tanjavur base. 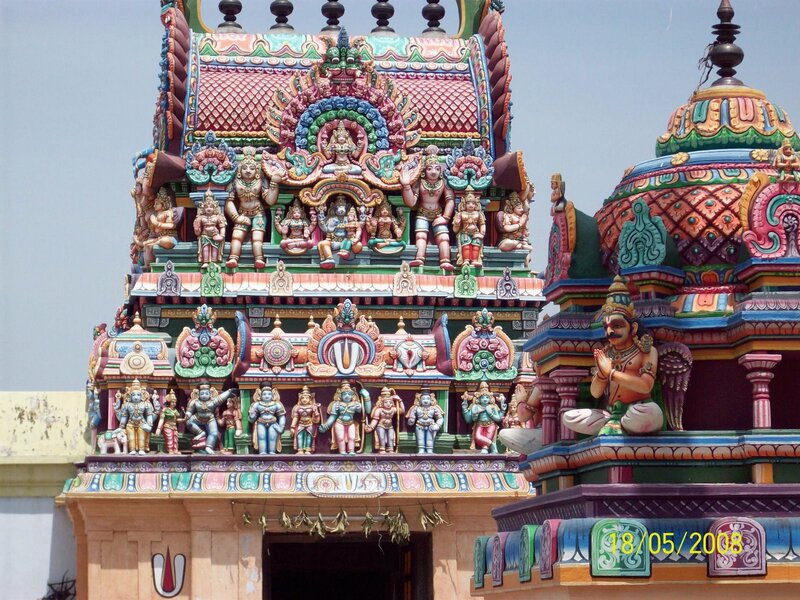 It is about 10 kms from Kumbakonam and 5 kms from Swamimalai, the famous Murugan (Karthikeyan) temple. It can be easily visited along with Thiruaadhanoor divyadesam that is just about a km away. Local Bus Nos. 12 and 30 ply from Kumbakonam to Pullam Bhoothangudi (via Swami Malai) on way to Thiruvaikavoor. The temple is open from 7.30 am to 12.30 in the mornings and from 4 pm to 7.30 pm in the evenings.